kg (10th percentile), Height 114 cm (10th percentile). murmur, vibratory in quality, at the left sternal border. nasolabial fold and weakness of the right face. sensation is intact. Her masseter function is not weak. Trapezius function is good bilaterally. is 2/4 and her right LE is 2/4. Her left side is not weak. sign on the right. Her left plantar reflex is downgoing. is hard to test on her right because of her weakness. Her left side is normal. the CT scan, can you estimate where her CNS "lesion"
1) Brain versus spinal cord ? 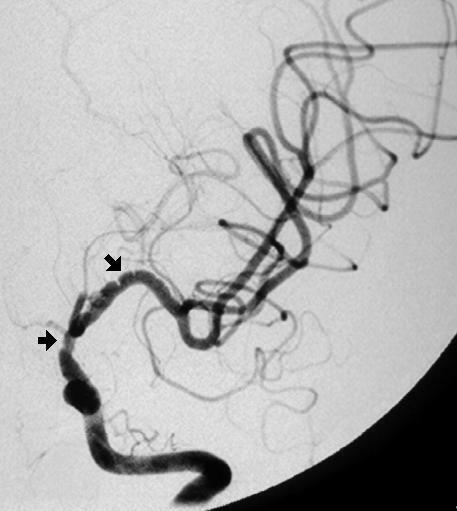 artery) and MCA (middle cerebral artery) distributions? A large infarct is not likely since she is alert. language. This is most likely a smaller lesion. 4) Where is her lesion likely to be? is unaffected, sensory pathways should be unaffected. brain in this region, refer to the diagram at any time. posterior horns are shown in this diagram. pallidus together form the lenticular (lentiform) nucleus. traverse through the posterior limb of internal capsule. View our patient's CT scan. 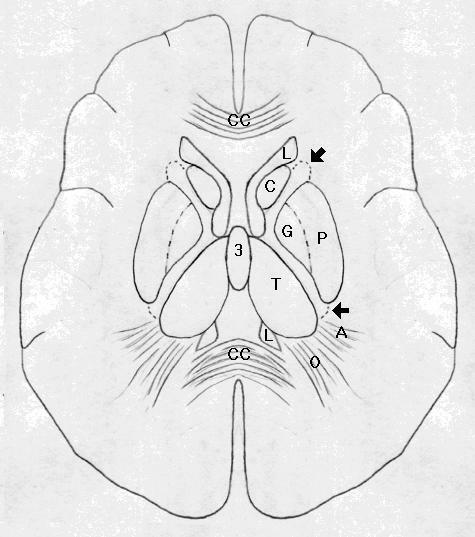 hypodense region in the left posterior basal ganglia. 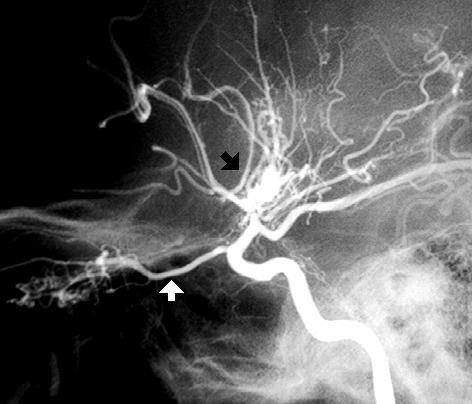 contrast suggesting that this is an ischemic lesion. admitted to the hospital. An MRI scan is obtained. 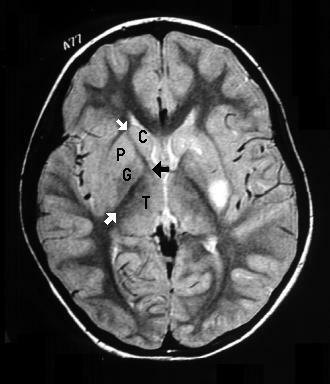 image shows the CSF within the ventricles to be white. internal capsule, and the head of the caudate. have difficulty identifying the structures. of internal capsule. The black arrow points to the genu. (T). The lateral ventricles are white. neovascularization providing collateral blood flow. translation of the Japanese term, moyamoya). 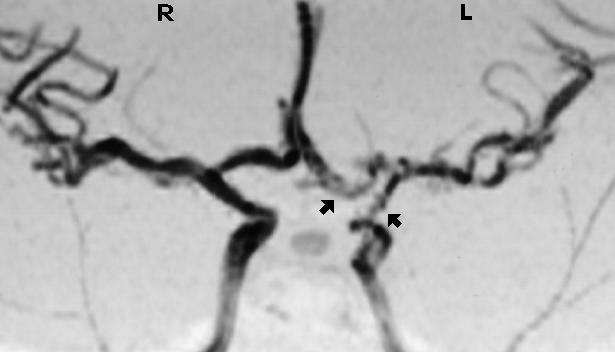 angiographic studies are not diagnostic of Moyamoya. seen as the embolus fragments and reperfusion occurs. blood vessels, hemoglobinopathy, and vasculitis. 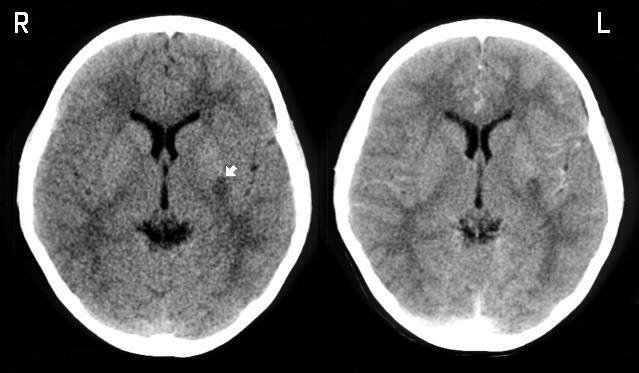 any child with an unexplained intracranial hemorrhage. hemiplegia attributed to basilar migraine in children. polycythemia, leading to thrombosis and embolism. increased risk of intracranial hemorrhage and stroke. Riela AR,  Roach ES. Etiology of Stoke in Children. Journal of Child Neurology 1993;8:201-220. Pavlakis SG, Gould RJ, Zito JL. Stroke in Children. 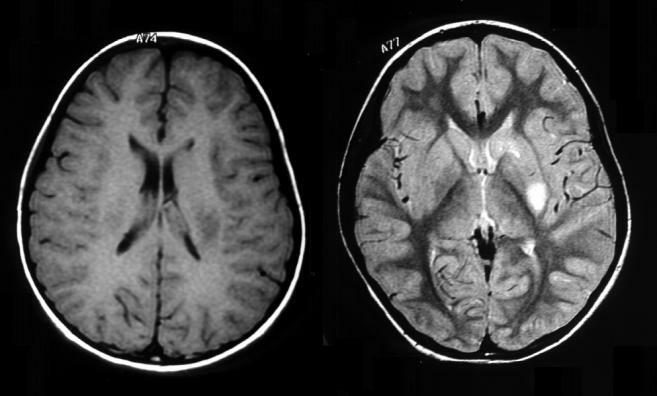 Childhood Moyamoya Disease:  Report of Five Cases. Journal of Child Neurology 1991;6:24-31.